There’s been a Carmelite church overlooking Balluta Bay since 1859. According to the Sliema Local Council website, it’s been rebuilt three times: in 1877, 1900 and 1958. But it didn’t become the Balluta parish church until 1974. It’s speculated that the name Sliema comes from the Maltese word sliem, meaning ‘peace’. 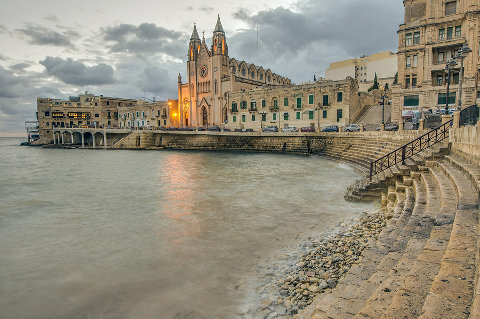 These days, the town is Malta’s main coastal tourist resort and one of the busiest places on the islands. Are you in Malta, or hope to be heading that way shortly? Then check out our Malta forum! This entry was posted	on Saturday 31 May 2014 at 04:28	and is filed under 2014, Malta. You can follow any responses to this entry through the RSS 2.0 feed. You can leave a response, or trackback from your own site.